Pyrmont’s time-warp Terminus Hotel will soon reopen, sporting a sympathetic look and Mediterranean menu alongside memories of nearly 32 years dormant. One of Sydney’s oldest licensed establishments, first pouring drinks on Christmas Eve 1841, the original pub was demolished and a Federation-style two-storey structure built in the early 1900s, becoming the Terminus Hotel in 1917 in reference to its location at the end of the old tram line. In 1986 Isaac and Susan Wakil purchased the tired pub and closed it, indefinitely. In 2015 they quietly sold the property to developer Auswin TWT, looking to build luxury terraces in its large carpark. The builder went on to list the pub itself for sale in March 2016. 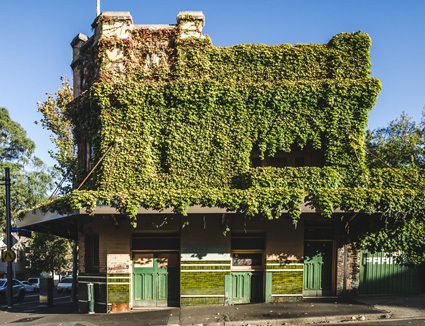 After widespread interest in the ghostly structure, which still held its licence, it was purchased by David Mathlin and Binu Katari, drawn to the building’s past and legacy. “We have a longstanding connection to Pyrmont and have spent the last two years reviving the Terminus to bring it back to its former glory in a way that genuinely resonates with the community,” explains Mathlin. Through complex heritage issues, a DA was approved that would see preservation with modernisation, through award-winning designers Luchetti Krelle and heritage architect Garry Stanley. The front bar has been restored in keeping with its appearance before closing, including attention to detail of the glazed green tiles both skirting the exterior façade and on the bar itself. It will offer a selection of standard and craft beers, including the Hotel’s own Terminus Lager, brewed especially by Endeavour. The new-fashioned kitchen, led by Turkish-born chef Bektas Mustafa Ozcan, formerly of Chiswick, will serve flavoursome home-inspired dishes such as slow-roasted oyster cut lamb shoulder and smoky eggplant caviar, plus more traditional pub fare such as fried flathead and chips, and the Terminus wagyu burger. Upstairs, the former manager’s residence has become Vera’s Cocktail Lounge – a complementary cocktail and dining area, named after the feisty wife of a former publican who vowed to never enter the place and ended up pulling beers for 16 years. Off Vera’s is one of the two private dining rooms, named 1917 in honour of taking the moniker, and restored balconies, from which the Hotel used to host street-side commodity auctions. There is also a new elevated outdoor dining space, with retractable roof, seating 40 pax. A few of the original 12 accommodation rooms have been repurposed within the hotel, but via a separate entrance for fire regulations there remains nine pub-style hotel rooms, two with their own en-suite. These are envisioned as some solution for the lack of modestly priced accommodation in the area, which is rich with corporate headquarters and function spaces. Topping off the elegantly restored and faux-antique fittings and furniture, a series of pre-resto images adorn the walls throughout, offering patrons a glimpse of the former decay, and scale of the project. 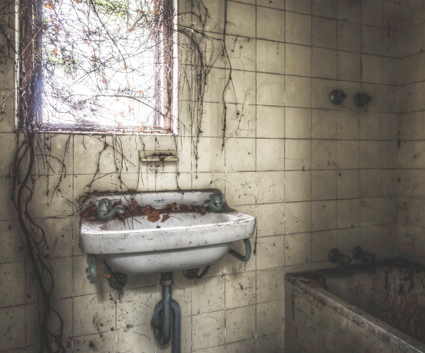 Bones of the new incarnation can be seen in the bleak, striking images of the pub prior to the renovation, with peeling paint and meandering vines both inside and out. Gracing the pub for the sneak-peak ahead of the opening was former publican Shirley Fitzgerald, who ran the Terminus and occupied the manager’s residence from the early 70s to early 80s, whilst raising six kids. Shirley is also releasing a book titled The History of Terminus Hotel, which will be available at the pub. “It was all fun and games back then,” she remarked, adding she was impressed by the sweeping changes. But taking the reins for the revival is former Keystone professional Belinda Clarke, who says she is excited they are finally about to reopen, and has been touched by local support. 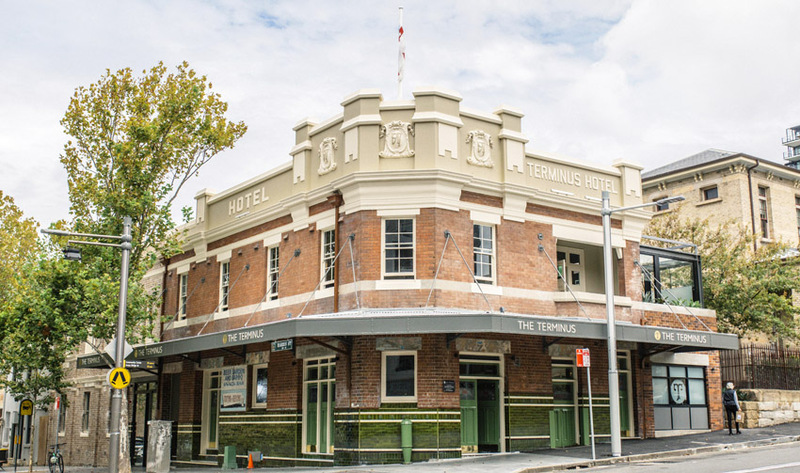 The beautiful semi-new Terminus Hotel will reopen to the public Monday, 5 March.